CAUTION: This engine has been identified as an INTERFERENCE engine in which the possibility of valve-to-piston damage in the event of a timing belt failure is MOST LIKELY to occur.A compression check of all cylinders should be performed before removing the cylinder head(s). 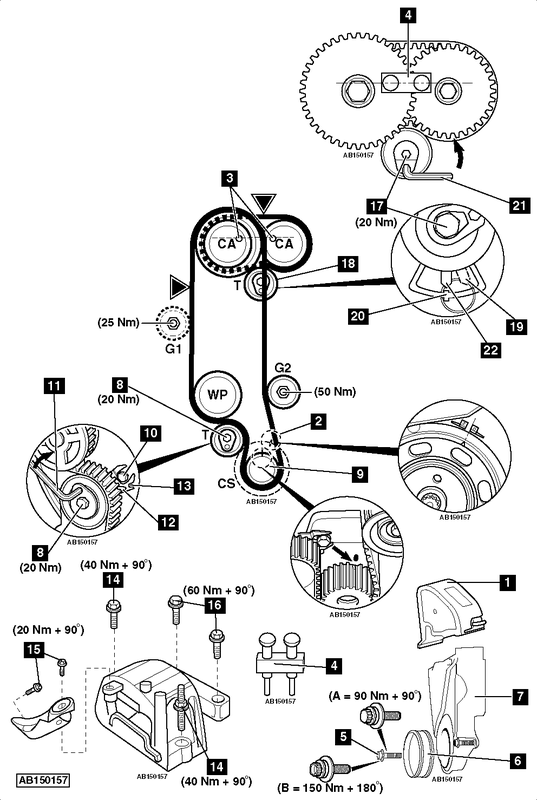 With AC: Auxiliary drive belt tensioner locking pin – Volkswagen No.T10060. Camshaft locking tool – Volkswagen No.T10016. Crankshaft pulley holding tool – Volkswagen No.3415. Crankshaft pulley holding tool pins – Volkswagen No.3415/1. Engine support – Volkswagen No.10-222A. Engine support adaptor – Volkswagen No.10-222A/8. Auxiliary drive belt. With AC: Use tool No.T10060.NOTE: Mark direction of rotation on belt with chalk if belt is to be reused. Ensure camshaft sprocket locating holes aligned  . Fit locking tool to camshaft sprockets  . Tool No.T10016.NOTE: Ensure locking tool located correctly in cylinder head. Fit crankshaft pulley holding tool. Tool Nos.3415/1. Remove timing belt lower cover  . Install engine support and adaptor. Tool Nos.10-222A/8. Disconnect evaporative emission (EVAP) canister. Windscreen washer reservoir filler neck. Evaporative emission (EVAP) canister purge valve bracket. NOTE: Guide pulley (G1) only fitted to BCA engine. Ensure locking tool fitted to camshaft sprockets  . Tool No.T10016. Remove locking tool from camshaft sprockets  . Tool No.T10016. Ensure locking tool can be inserted into camshaft sprockets  . Tool No.T10016. A (bolt with plain head) = 90 Nm + 90°. B (bolt with recessed head) = 150 Nm + 180°. Remove holding tool. Tool Nos.3415/1. Tighten bolts securing engine mounting bracket to engine. Tightening torque: 50 Nm. Use new bolts. Long bolts securing engine mounting to body  . Tightening torque: 40 Nm + 90°. Use new bolts. Short bolts securing engine mounting to body  . Tightening torque: 20 Nm + 90°. Use new bolts. Bolts securing engine mounting to engine bracket  . Tightening torque: 60 Nm + 90°. Use new bolts. Drive belt.NOTE: Mark direction of rotation on belt with chalk if belt is to be reused.